Home » Music » The Red Button – Now it’s All this! 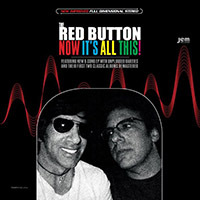 The Red Button (Seth Swirsky and Mike Ruekberg) is back with Now It’s All This!, their third release. Along with six new Beatles-esque beauties, Now It’s All This! contains unplugged rarities of four Red Button classic tracks, too. As if that weren’t enough, we also get remastered versions of their first two critically acclaimed LPs, 2007’s She’s About to Cross My Mind and 2011’s As Far As Yesterday Goes.